Goan Fish Curry recipe is the most popular curry in Goa and rest parts of India. It’s an everyday staple with rice. 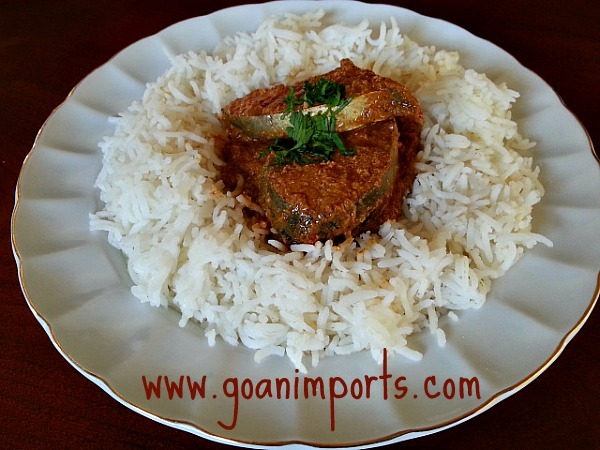 Goan’s loves their rice and fish curry or Xitt Codi as it is called in Konkani the local language. Goa is located on the coastal belt in India and fish is an integral part of Goan food diet. It’s the least complicated curry I know and is made by simply combining the ingredients and simmering it for 30 to 45 minutes to perfection. It’s also versatile you can use fish, meat, shrimps and vegetables. I have cooked it in all ways, and it taste delicious. 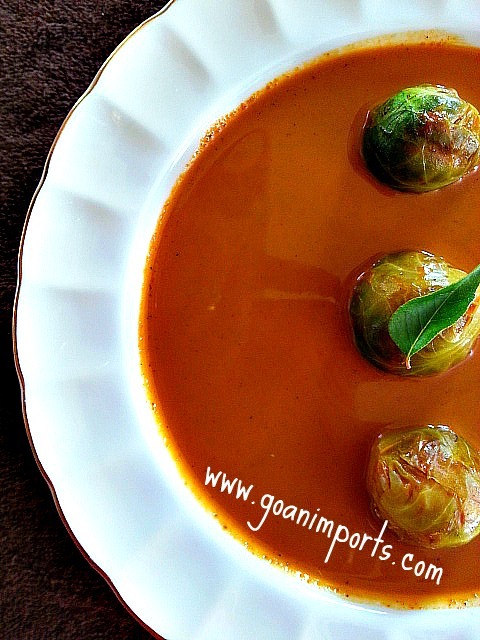 This post gives you the bare bones idea of making the famous Goan curry. One of my guilty pleasures is the next morning for breakfast to take some curry in a pan and simmer till it thicken and eat it with freshly baked french loaf the aroma will have you drooling for more. Apply salt to fish or chicken and keep aside. Grind together 1/2 can of coconut milk, shredded coconut, garlic, spices all together for 1-2 minutes. Pour the content into a pot add the chopped onions and the remaining coconut milk and water. Boil on medium low heat uncovered for 45 minutes. When using fish, add it now along with curry leaves and cook for another 10 minutes. Add cut 2 lbs chicken in the beginning and salt to taste. Boil for 45 – 55 minutes on medium heat uncovered. Serve with White Rice. If you are a vegetarian no worries, I used Brussels sprouts and it was yummylicious. Add it just as the fish for 10 minutes. Okra, whole peeled raw mango, pumpkin, butternut squash works great. If you don’t like tamarind you can skip but it makes a huge difference in the taste if added. This deep orangish red coconut curry from Goa will make a lasting impression. No matter where you go this Goan fish curry recipe is always part of my and countless Goan’s who live away from home, part of their heritage and gets passed down from generations to generations. I maybe a bit late to comment on this recipe. But I had to, otherwise I would become restless and hopeless and worse have ‘SLEEPLESS NIGHTS’. Well well well the ‘GOAN FISH CURRY’ looks absolutely, ‘BREATHTAKING’. ‘GOANS TAKE TO FISH LIKE FISH TAKE TO WATER AND VICE VERSA’. Your pics make the fish curry look very very ‘PALATABLE’. And if I may say this ‘YOUR FINISHED PRODUCT FILLS MY/OUR TUMMY’. My spouse buys a lot of fish here in the UK. But the fish is not as tasty as fish caught in the ‘ARABIAN SEA’ in Goa. The Arabian Sea is a ‘BLESSING IN DISGUISE’ to Goa and it’s people. Now My only concern is the OVER-FISHING which goes on in Goa. That has to be regulated. Otherwise some species of fish may become extinct before long. The government of the day has to put regulations in place and strictly enforce it. Otherwise We are heading for a enviromental ‘CATASTROPHE’. 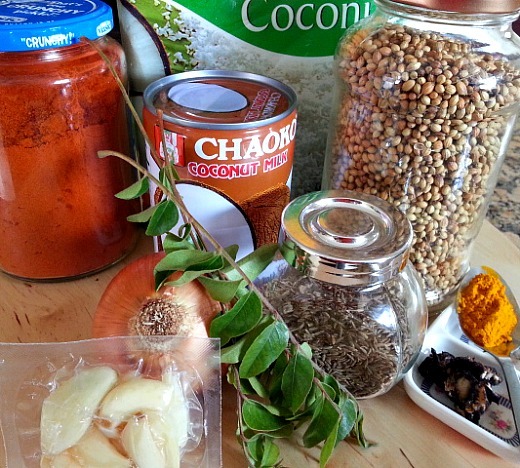 Now that I saw this Goan fish curry recipe, We will put it to the test as a matter of URGENCY. WITH ALL MY PRAYERFUL WISHES! Thank You so much Mr Stan. Appreciate your kind words. Wishing you too a lovely week. Reblogged this on My Midnight Kitchen. Pleasure … hope to make it soon! This looks fantastic. I look forward to reading (and trying) more of your recipes. Thanks for visiting my blog too! This is making my mouth water! Thanks for visiting my blog. This looks delicious. Can you please post the recipe for the usal which is eaten with pav for breakfast. Ate it in Goa eons ago. Thanks. Thanks Shu! I sure will soon as I do have it in the works. why this looks simply marvelous!!!! !